These Celtic cross baby earrings, like all the Irish made jewelry at The Irish Gift House, are nickel free and hypoallergenic. 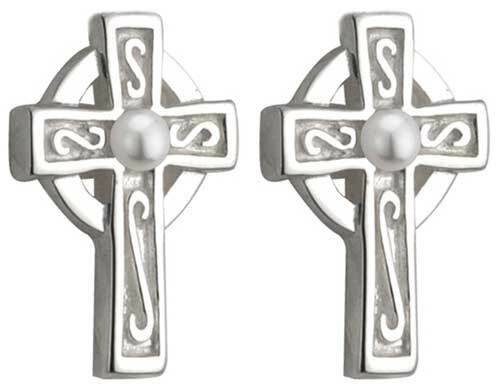 These Irish baby's Celtic cross earrings feature a silver plated finish along with tiny glass pearls in the center. 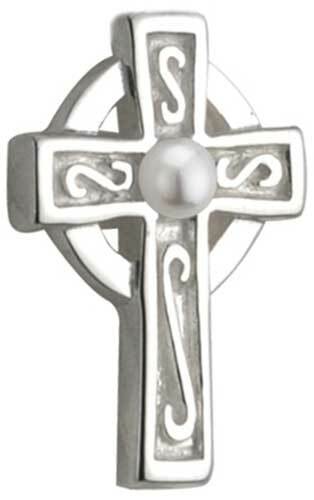 The child size Celtic cross stud earrings measures 3/8” wide x 1/2” tall and are post style with push on butterfly backs. These child's size Irish earrings are part of the Little Tara Ireland Collection from Solvar Jewelry in Dublin, Ireland, they are gift boxed with a Celtic cross history card, complements of The Irish Gift House.